2-16 –Metallica Am I Evil? Published By – Muggins Music Inc. 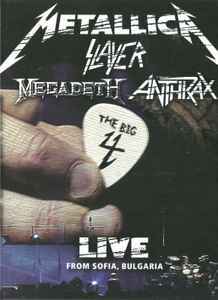 Published By – Amgine Music Inc.
DVD Bonus Feature: Behind the scenes documentary, giving you exclusive access to The Big 4 backstage at Sonisphere, including interviews and "Am I Evil ?" rehearsal footage. Issued in a digipak case with double clear DVD tray and with a 12-page booklet with photos and credits.